Having recently lost their fair sloop Angelica to the Royal Navy, the pirates were strongly inclined to get her back. They travelled secretly through the dense jungle to the lightly guarded pier where the Angelica lay. 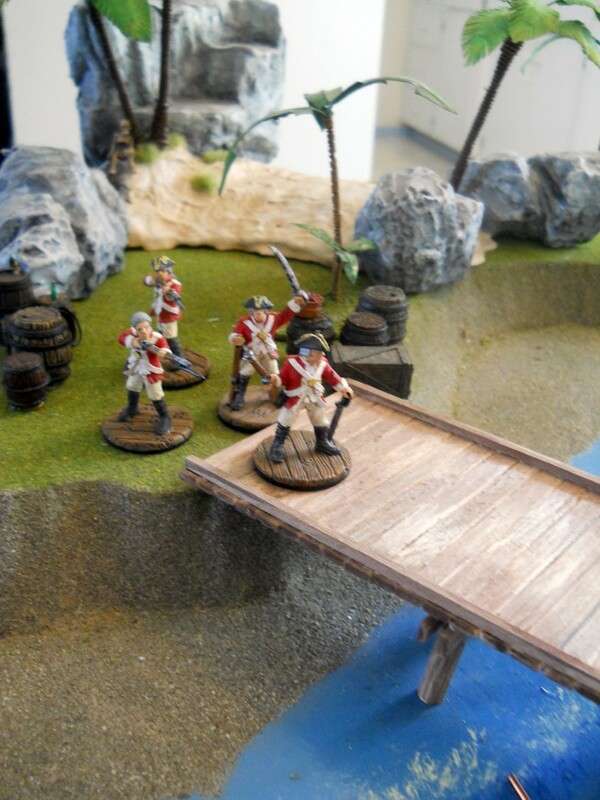 They were but 4 humble pirates against a force of seven Royal Marines and their sergeant. 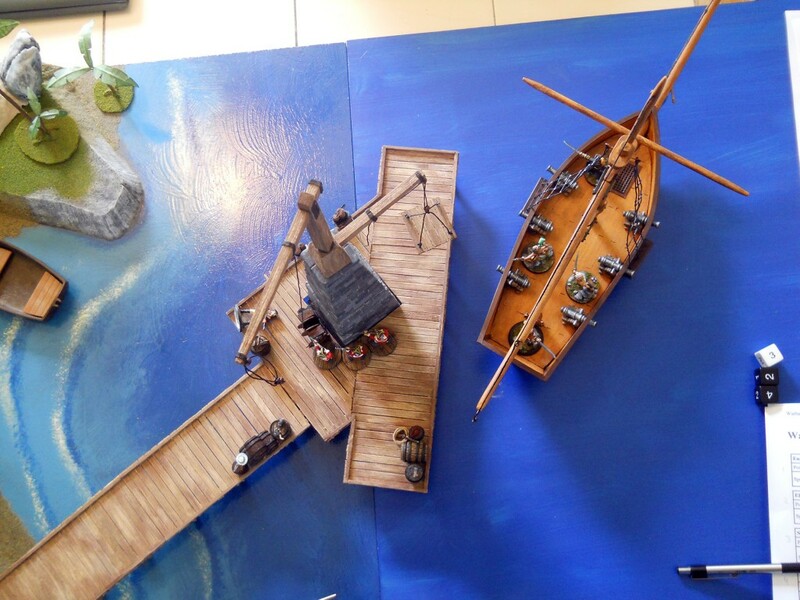 Knowing that Marine reinforcement would arrive 5 turnovers after the Marines become aware of the attack, the pirates needed to act quickly and quietly. Elizabeth Hunter and Eugene Smythe continued quietly up the path toward the dock while Seamus Gibb, his jug of rum always at the ready, and Shandy moved to cover along the beach. At the signal, Shandy and Seamus fired at the as yet unaware Marines. Shandy’s shot was true and the Marine at the foot of the dock fell dead. Seamus’ shot knocked the second Marine down. At the same time, Elizabeth rushed forward and finished the second marine off where he lay. Eugene for his part was apparently caught unaware and failed to move forward. Turnover 1. The Marine sergeant, now alerted, issued orders to return fire. Poor Elizabeth had a close brush with death as a musket ball knocked her to the ground. All the other shots went wide in the rushed confusion. The final marine, though out of earshot of the sergeant’s orders, also fired at the attackers. Elizabeth lept to her feet and charged onto the dock. Shandy finished reloading and fired at the Marine on the dock killing him. Eugene, finally coming to his senses, charged forward onto the dock. Seamus must have taken a draft from his jug as no action was seen from him. Turnover 2. The Sergeant activated using his one action to order his troops to reload which they all busily tended to, except for the Marine at the far end of the dock. He must not have heard the order because he neither followed the order nor reloaded on his own. Elizabeth charged up to the Sergeant and, swinging her cutlass, knocked the Sergeant to the ground. Eugene, all business now, charged another Marine knocking him down as well. 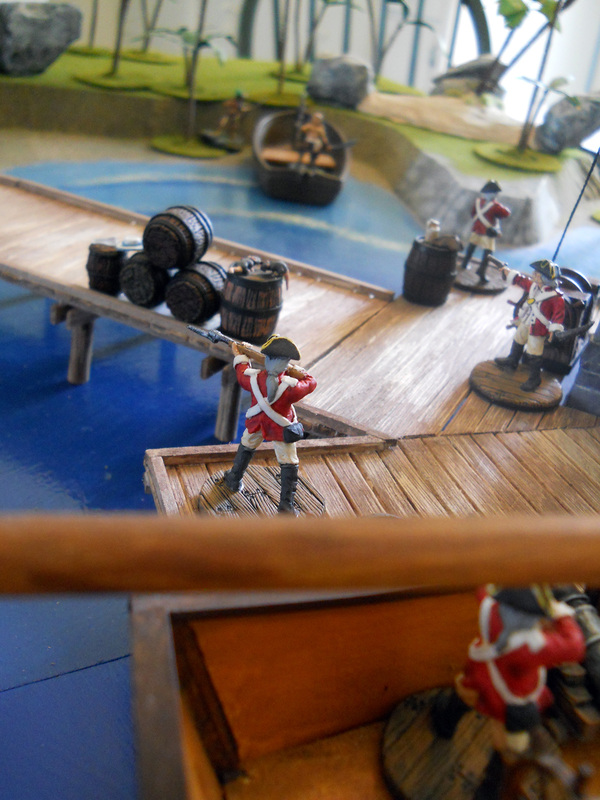 Shandy huddled inside the boat and reloaded his musket. Seamus must again have drank heavily from the jug because his musket was again silent. Turnover 3. 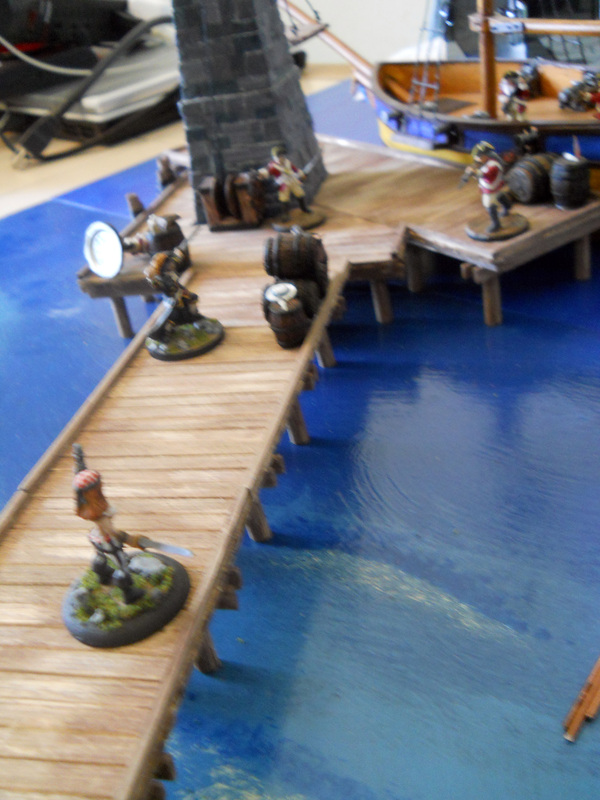 Thinking quickly, the Sergeant recovered his footing holding back the pirate lass but was unable to shout any orders. The Marine fighting Eugene scrambled to his feet unharmed. 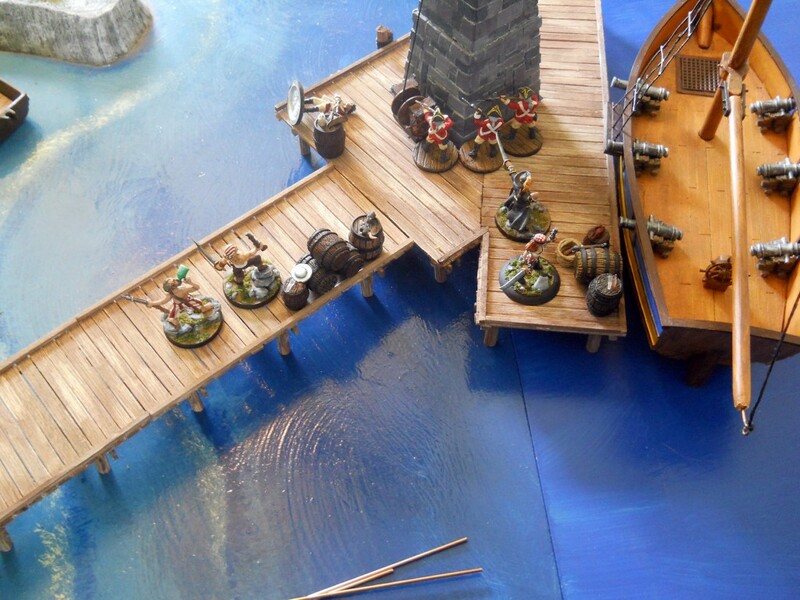 The Sentry at the far end of the dock regained his wits and reloaded his musket but the Marines on the ship were befuddled by the turn of events and did nothing. 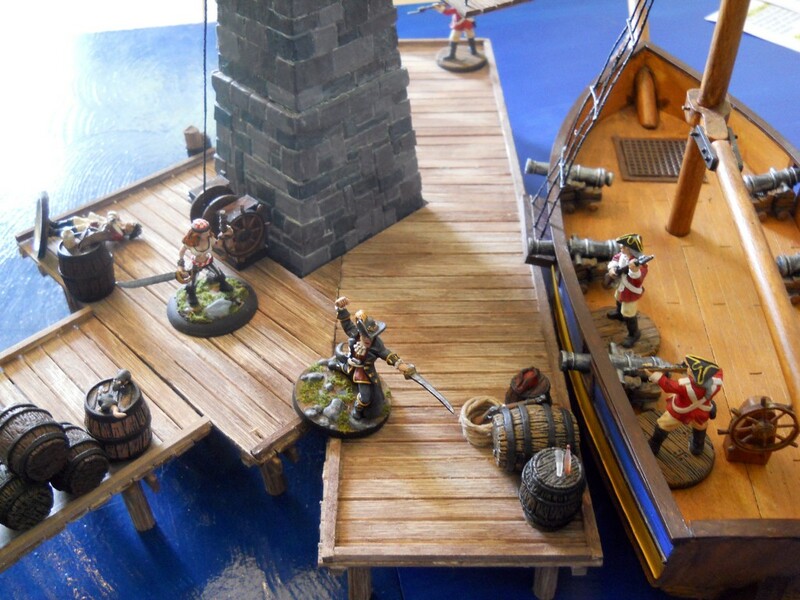 Having seen their Sergeant fall to the blood thirsty pirates, the Marines on the ship failed their morale checks and threw down their weapons. Seeing himself the lone protector of the dock, the final Marine chose discretion over valor and surrendered. The pirate band siezed the Angelica and made sail. 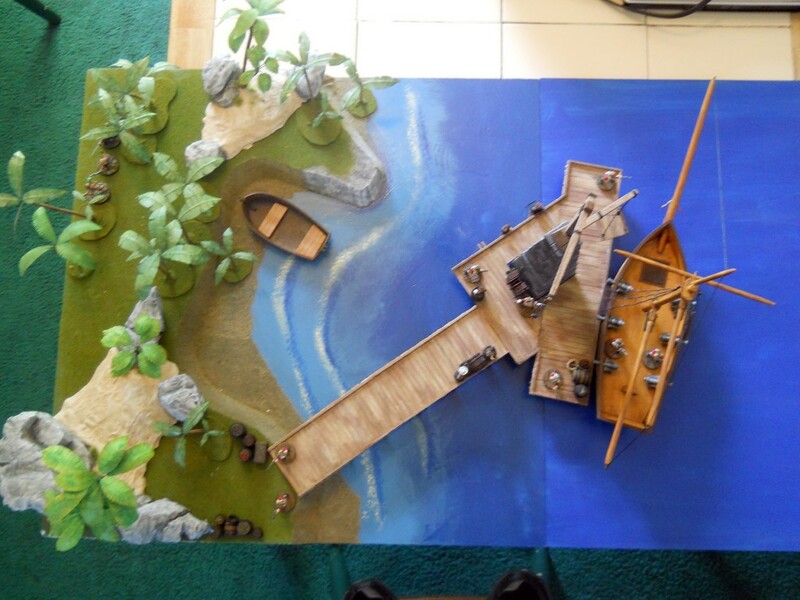 This entry was posted in Battles, Fear and Faith, Flashing Steel, Miniatures, Pirates, Terrain, Uncategorized by CaptainRumm. Bookmark the permalink. Thanks for the battle report. Amazing gaming board and nicely figures figures, and a helpful look at Flashing Blades. I’ve just bought a copy myself and it’s nice to see the rules in action. Thanks for the battle report! Nicely painted minis, an incredible table, and a helpful look at Flashing Steel. I’ve just picked these rules up and it’s nice to seem them in action. Thanks! I’m just learning the rules myself. They are very fun, quick and the basics are really easy to grasp. 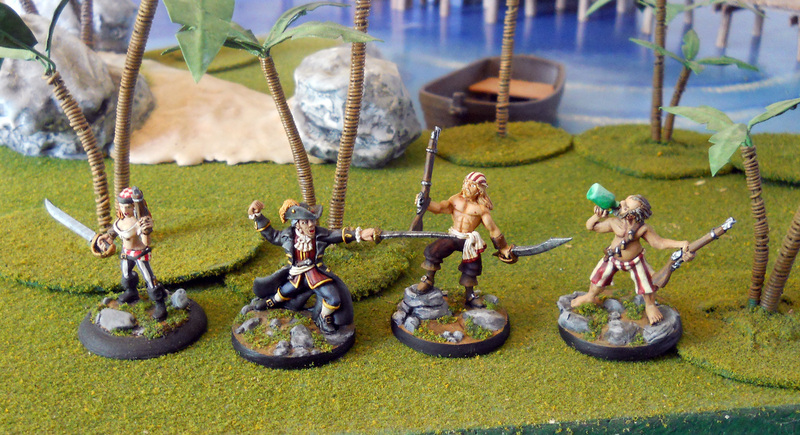 The swashbuckling actions seem like they would benefit from a lot of “furniture” and terrain details. OK, I am definitely going to check out Flashing Steel. Your board and figures are incredible! 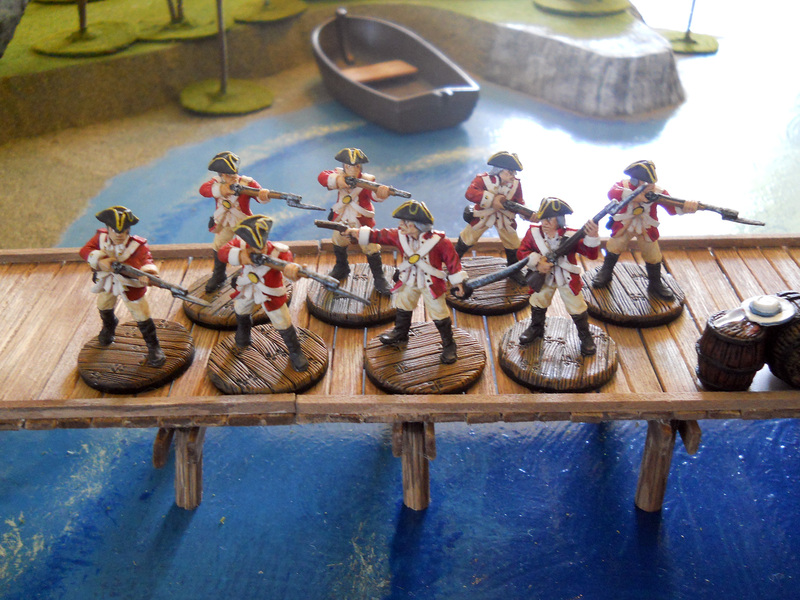 How did you achieve the wood on the bases of your Marines? Flashing Steel is a fun game!